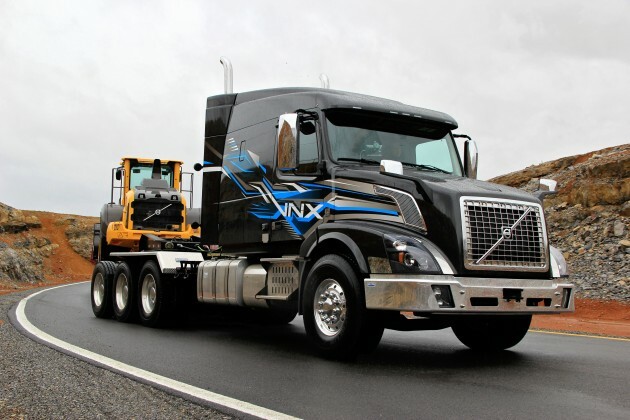 GREENSBORO, N.C. — Volvo’s VNX heay-haul tractor is now available in tri-drive configuration. The latest offering is ideal for heavy equipment hauling, oil and gas applications and timber transport. The tri-drive offers increased payload and maximum traction, Volvo claims. The tri-drive can manage up to a 69,000-lb rear axle load and the extra drive axle helps the VNX 630 traverse steep terrain, mud, ice and other off-road conditions. The VNX 630 is available with up to 600 hp and 2,050 lb.-ft. of torque, put out by the Volvo D16 engine. It comes standard with I-Shift. Truck News test drove the VNX last year. You can read that review here.